This copper source led mankind out of the Stone Age. It is uncertain whether native gold or native copper was the first metal ever collected, but copper was clearly the utilitarian metal that led mankind out of the Stone Age. Native copper was less malleable, but harder, than gold, and simple hammering or casting could fashion it into various shapes for use as tools and weapons. But native copper alone was too rare to have a major societal impact. Although copper is a relatively abundant metal, most is locked up in such minerals as chalcopyrite, cuprite and chalcocite, which are now the primary ores of copper. The term “ore” refers to any mineral containing a valuable constituent for which it is mined and worked. The valuable constituent in copper ores, of course, is copper, which is recovered in metallic form by the process of reduction smelting. Smelting is not simply a matter of “melting” a metal out of its ore, but a complex, two-stage, thermo-chemical reaction. In the first stage, copper compounds are converted by thermal decomposition into copper oxide. In the second stage, a high-temperature, reduction reaction in the presence of a reducing agent such as carbon chemically reduces the copper oxide to metallic copper. One of mankind’s greatest early achievements was learning that copper could be obtained from certain minerals that exhibited no obvious metallic properties, and devising a basic smelting process to accomplish just that. 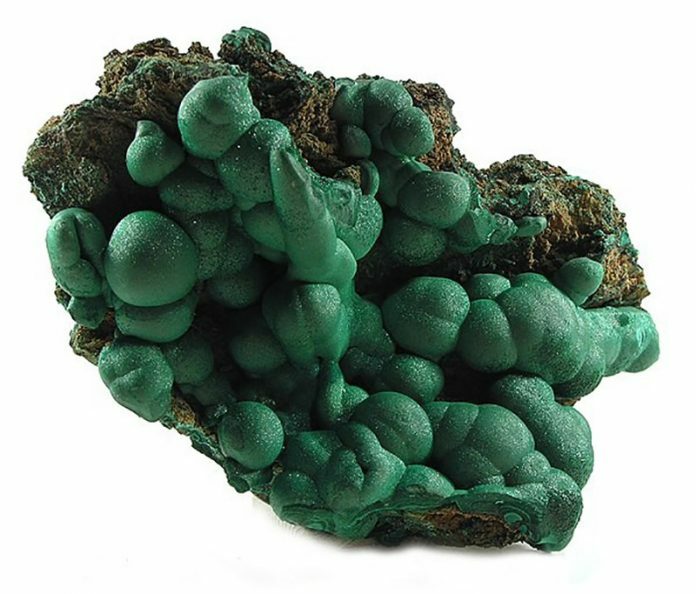 The first mineral mined specifically for smelting was malachite, or basic copper carbonate, an oxidized mineral with a distinctive, bright-green color that frequently occurs in association with native copper. It is unclear, however, exactly how early metallurgists learned that copper could be extracted from malachite. Initially, anthropologists theorized that malachite-bearing rocks in fireplaces were converted to copper by the heat of fires, but undrafted fires are not hot enough to smelt copper ores. Another possibility focused on malachite’s early use as a green pigment, and suggested that heating powdered malachite might have produced metallic copper. But no known, ancient pigment-making process would have generated the required level of heat. A prerequisite to smelting copper ores, therefore, was the development of drafted charcoal furnaces that produced temperatures in excess of 1300°F. These had appeared by 6000 BCE and were first used to fire ceramics. Because powdered malachite was a common pigment in early pottery glazes, it is possible that firing malachite-glazed ceramics could have produced metallic copper. Anthropologists now believe that the more likely scenario was that impure masses of native copper were melted in drafted charcoal furnaces preparatory to casting. This native copper, likely associated with substantial quantities of malachite, would have been heated in direct contact with burning charcoal fuel. Ancient metallurgists may have observed that the resulting molten copper exceeded the original amount of native copper. They could then have logically deduced that the additional metal could only have come from the malachite—and that malachite itself could be mined and converted to copper. The mining and smelting of malachite, along with associated azurite and other brightly colored, oxidized copper minerals, made metallic copper relatively plentiful and led to the emergence of the Copper Age. By 5000 BCE, various techniques for smelting malachite ores had been developed independently in southeastern Europe, the Middle East, and the Far East. Few technological advances have had greater significance. Realizing that metallic copper could be derived from relatively abundant and easily identifiable, green-blue “rocks” represented a quantum leap in mankind’s understanding of the natural world. The basic principles of copper smelting were later applied to other ores, including those of iron. Smelting iron from such abundant ore minerals as hematite and magnetite ushered in the Iron Age, another major step in the technological progression that began some 7,000 years ago when early metallurgists began heating malachite together with charcoal in drafted furnaces.